What's The Video Game You Just Keep Going Back To? Every once in a while, when I’ve got a couple hours to kill or just feel a certain craving, there’s always one game I’ll pick up: Sid Meier’s Colonization. 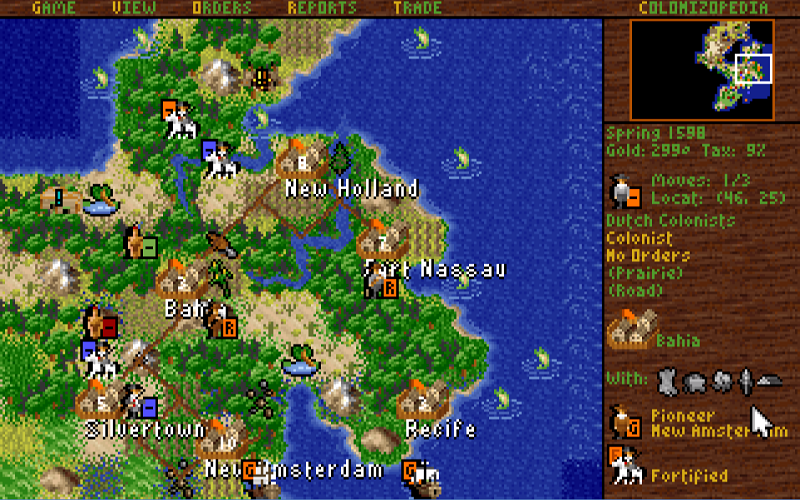 This unlikely 1994 Civilization spinoff, which Luke has written about at length, is a top-down strategy game set in the 16th and 17th centuries. As an explorer from one of four major European powers, your job is to head west with nothing and somehow build a thriving, sprawling country. The American dream. You can farm for crops, fight off foreign nations, trade with Native Americans (or burn down their villages), build up an army, and eventually start a revolution. It’s a brilliant game, full of minute-to-minute decisions that require smart thinking and planning. And I love it, not just because it’s so rewarding to create an efficient network of well-staffed colonies but because everything about the game feels comforting, from the little pixels that make up each citizen to the way Native American tribes will always, without hesitation, try to ambush and steal any treasure you might find. I’ve spent two decades playing this game, on and off, and I know all of its intricacies and rule-sets like the back of my hand, if the back of my hand were a pixelated depiction of America to conquer. I’ve even grown fond of the weird janky bugs—pro tip: try to keep your ships on separate tiles or else they might accidentally swap cargo—and the horrible tendencies of Colonization’s annoying AI opponents. It’s comfort food to me. So what about you, Kotaku readers? What’s that video game you just keep coming back to, year after year? What’s your video game comfort food?